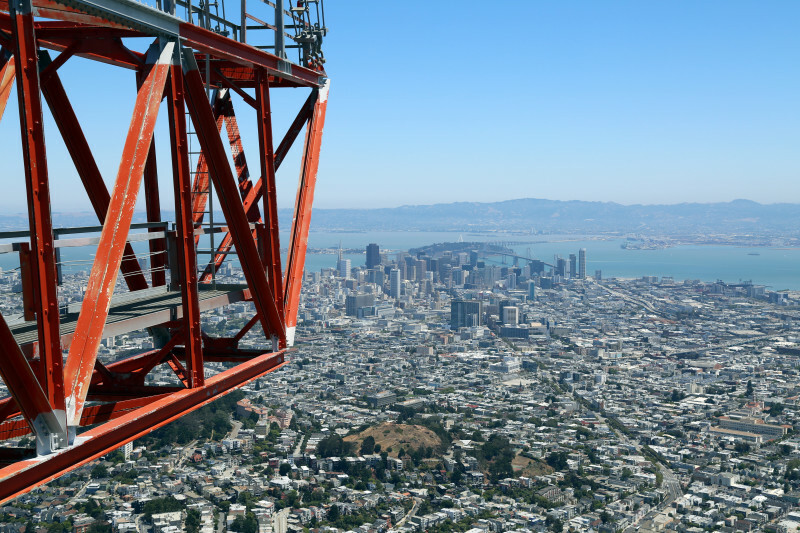 What is the story behind the construction and approval of Sutro Tower? Back in the 1960s, San Francisco had really bad television reception. By many accounts, it was the worst of any city in America. Good reception required a clear line of sight from the broadcast tower to your TV antenna, and in hilly San Francisco this was a challenge. Broadcasters began the hunt for a location to build a very tall tower that could send a clear TV signal far and wide. ABC already had a 588-foot tower on top of Mount Sutro, and it started lobbying for the new tower to be built there. 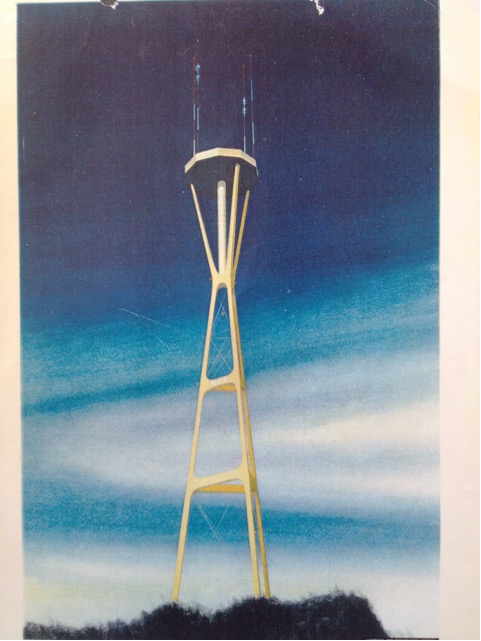 Designs were drawn up, and ABC started showing off a tower that looked like a sleek golden Seattle Space Needle. It even included a restaurant at the top. ABC invited residents around Mount Sutro to discuss the plans during two meetings. Initially, neighbors had concerns over safety, property values and the city skyline. “What the people were told was very simply this: Either you go away and you let us build our tower, or we will make sure the open space around Mount Sutro is torn down and all of the green belt is removed,” says Christine Linnenbach, a lawyer who has fought Sutro Tower Inc. in court and whose childhood home is a few blocks from the tower. Linnenbach says ABC delivered an ultimatum: a tower and a park or no tower and no park. The neighbors didn't know that this was an empty threat. The park was already included in the city’s plan for a green belt. But their fear of losing the park caused residents to keep quiet, and ABC used the "lack of neighborhood opposition" to help push the Mount Sutro site through. 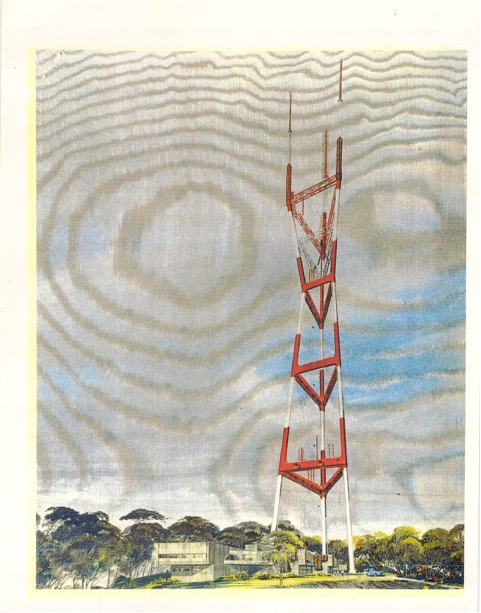 Among the loudest opponents of Sutro Tower was the San Francisco Chronicle. Lawyers representing the paper fought the tower at hearings in front of the San Francisco Planning Commission and the San Francisco Board of Supervisors. The paper argued Sutro Tower would ruin the skyline, and it questioned the logic of placing a tower within striking distance of an elementary school, reservoirs and hundreds of homes. But the Chronicle wasn't an impartial observer. The paper had its own television station and wanted to see the tower built on San Bruno Mountain. Ultimately, the Federal Aviation Authority rejected the proposal because it was too close to the airport. In 1966, the San Francisco Planning Commission approved the site at Mount Sutro, passing the decision on to the San Francisco Board of Supervisors. The supervisors voted 6-to-4 against building the tower, but two more votes were needed to overturn the Planning Commission's approval. 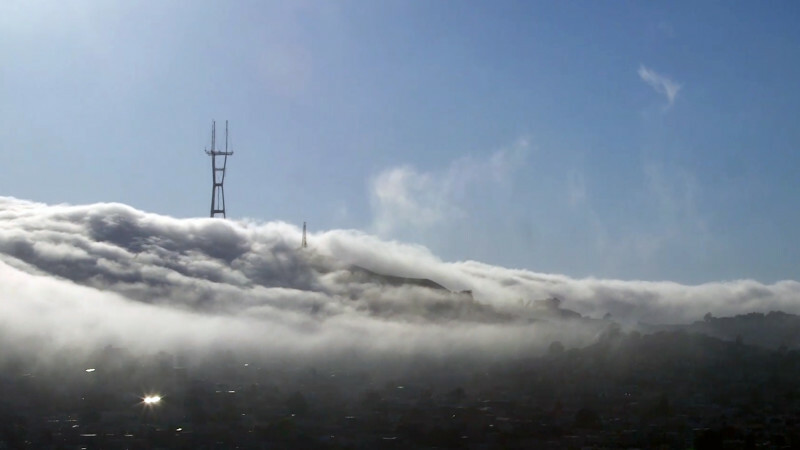 The decision was final; a tower would be built on Mount Sutro. Leading up to construction, the tower's design underwent huge changes by Los Angeles architecture firm AC Martin and Associates. It became more skeletal-looking with a broader top and waist. Eric Dausman, general manager of Sutro Tower, says the architect’s decision to taper the center was entirely aesthetic. “All the engineers since then want to shoot him. It made it a more difficult structure to maintain, and it is a more difficult structure to keep perfectly upright and in a great condition,” says Dausman. By the 1970s, public interest in Sutro Tower had ebbed and few news outlets were reporting on it. The tower’s fiercest opponent, the Chronicle, had warmed to the tower after its television station became a partner in building it. When construction finally began in 1971, the local media were silent. Television stations involved had made a gentleman’s agreement not to report on the tower. Some called it a media blackout. In their defense, the four stations, KTVU, KPIX, KGO and KRON, claimed it was so that nobody would have the jump on advertising the new tower. But an editorial that ran in the San Rafael Daily Independent Journal suggested the group was silent because they knew the tower would be unpopular. The legs are anchored in 15 million pounds of cement. The tower is composed of 3.5 million pounds of steel. It is 977 feet tall. The highest point is 1811 feet above sea level. Construction cost $4 million in 1971. The tower hasn’t been painted in over 20 years. “The biggest problem with painting is that we also painted a lot of the neighbors' houses and cars. … The crew is as careful as they can be, but they’re 700, 800, 900 feet in the air, and a drip goes a long way,” says Dausman. When bulldozers began taking out trees on top of Mount Sutro, KQED Newsroom reporter Tom De Vries and cameraman Charles Rudnick hiked up to the construction site. “We started taking pictures and a man came running out of the work office, running towards us saying, ‘You can’t film here! There’s an agreement!’ … Well, the story just got way better,” says De Vries. KQED-TV ran the story, sparking new efforts to stop the tower by University of San Francisco law students and two San Francisco Supervisors. 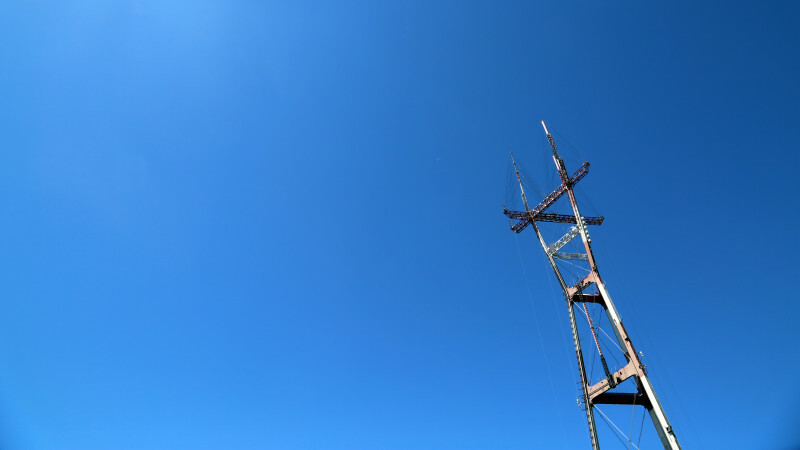 Sutro Tower beamed out its first transmission on July 4, 1973. In designing the tower, engineers realized that the antennas would sway in strong winds, so they added girders and a network of cables to keep it in place. “Unfortunately, one of the byproducts was that wind would rush through these newly created guide wires, and the whole tower would sound like a moaning harp,” says Linnenbach. The cables have since been redesigned and are not as loud. Dausman says he understands people who consider the tower an eyesore. If it were up to him, the tower wouldn’t even be here. “This is the wrong place for a broadcast tower to serve all of the Bay Area as it has emerged in the last 40 years,” Dausman says. "It’s not really in the center." He thinks the ideal spot would be somewhere in Hayward. But at this point, the tower is isn't going anywhere. 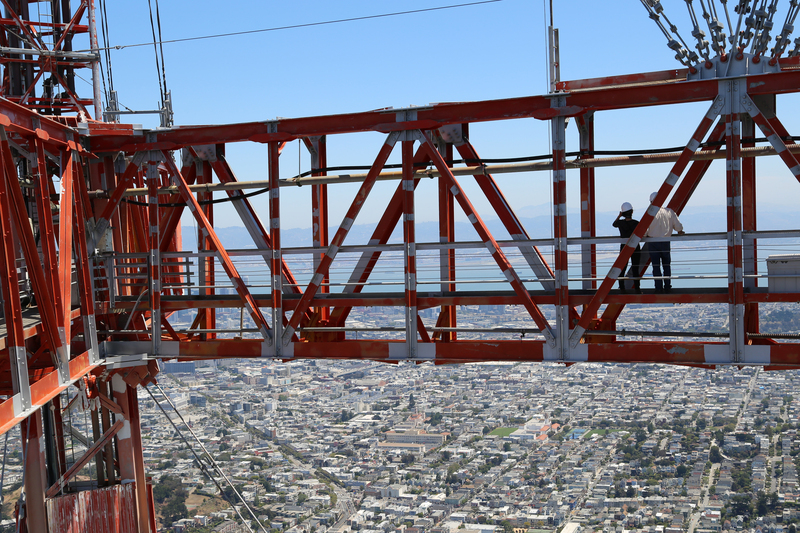 These days Sutro Tower is used for more than just television. Emergency responders, traffic control, taxi dispatchers, law enforcement and radio all use the structure. And many residents have come to love Sutro Tower. You can find the icon in boutiques and even tattooed onto people’s bodies. Newcomers use the tower’s prominence to navigate the city, while other San Franciscans profess to love the structure that many tourists find ugly and strange. When fog swirls in around the foot of the tower, people describe it as a ship sailing atop the clouds, a ladder to the blue skies always just out of reach in San Francisco.